The XII International Congress of the Italian Association for Catalan Studies (AISC) will begin this Thursday at the Università per Stranieri di Siena. 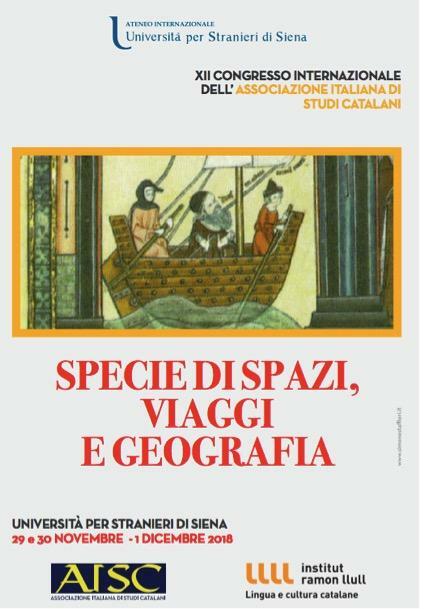 In collaboration with the Institut Ramon Llull, “Specie di Spazi, Viaggi e Geografia” will host academics and scholars from across the organization’s University Network of Catalan studies abroad. The multi-disciplinary comparative studies congress analyzes diverse aspects of Catalan culture using a cross-cutting approach. Through the prisms of space, travel and geography, presentations consider a wide range of topics, including space and identity, cities and literature, real and imaginary journeys, cross-cultural voyages, translation spaces, and Catalonia in Europe. World-renowned researchers from universities in Italy, Catalonia, Valencia and the Balearic Islands as well as representatives of the Government of Catalonia’s delegation in Rome and the Institució de les Lletres Catalanes are expected to attend. The Italian Association for Catalan Studies was founded in 1978 by researchers focusing on Catalan language, literature, linguistics, history, art history, and architecture. Current members run the gamut of those interested in the interstices between Italy and Catalonia. Adopting an interdisciplinary approach, the association explores Catalan language and culture through scientific and pedagogical lenses. The association, which aims to promote critical awareness of Catalan culture in Italy, won the XXI Ramon Llull International Prize in 2011. The AISC is one of eight Catalan studies associations across the globe. With one exception (the AILLC), these organizations comprise Catalan language and literature experts and scholars who received their training or reside outside the Catalan-speaking territories. Their programming is supported by the Institut Ramon Llull. Further information about the congress and speakers is attached.